Chef’s Pencil is for sale. It is an exciting opportunity for people who are passionate about food; whether you are a chef, someone who loves entertaining, a restaurant, a winery or a kitchenware retailer. First, here is a little more about Chef’s Pencil, how it’s grown, its audience and why chefs and food lovers from around the globe enjoy contributing, browsing and reading this unique website. About 12 years ago, Chef’s Pencil was founded after we identified a need for a website which catered for a more sophisticated audience. The recipes are presented in an easy to understand format with high quality, inspirational images; much like those in professionally printed cookbooks. What Makes Chef’s Pencil So Special? Chef’s Pencil brings highly motivated, world-class and celebrity chefs who have an insatiable passion for food and presentation, to an audience who love to acquire new skills, cook and entertain. Our chefs present their unique cooking style and award-winning recipes in an easy to follow and understand format, which enables our audience to replicate their successful and impressive cooking techniques. Since its inception, our audience has grown gradually and organically over time. The quality and reputation of chefs featured on Chef’s Pencil has also grown. Each time a highly acclaimed chef joins our team, so his or her peers and equally acclaimed competitors are attracted to the website. Today, Chef’s Pencil has over 225 of the world’s top chefs with over 650 contributed recipes, articles and tips. Chef’s Pencil features recipes from 20 of the world’s 3 Michelin starred chefs who see Chef’s Pencil as a platform to market their own restaurants, books, products and services to a larger audience. Chef’s Pencil is a strong and successful brand with a highly engaged audience who trust the world-renowned chefs we feature. Chef’s Pencil audience members are extremely passionate and sophisticated foodies. 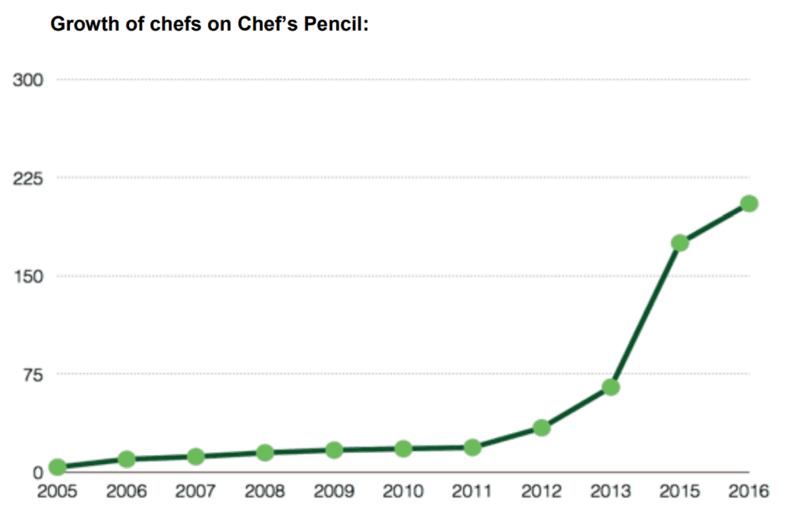 Chef’s Pencil has consistent and organic traffic growth. Chef’s Pencil provides an opportunity to generate business leads and revenue. Chef’s Pencil is a quality product in a niche market. If you are a business owner in the food service, catering or kitchen supply industries, or you own a restaurant or cafe, Chef’s Pencil could provide your business with opportunities to cost-effectively increase your business exposure. Interested? Please fill out our Contact Form below and we will be in touch!